Mudbound is an important film, both for its subject and because it further announces Dee Rees as a formidable talent. Should a film be considered solely on its own merits, disregarding its creators and contributors? This is a question often asked when considering the work of controversial actors and directors, a question used to either defend or condemn. In the case of Mudbound, the new Netflix film based off of Hillary Jordan’s 2008 novel, the question of who made the film feels important to understanding it. Taken agnostically, Mudbound is a beautifully shot, sensitively written and fussily formal portrayal of the life in the American South during World War II. When one considers, however, that this film was co-written and directed by a queer black woman, Mudbound means something more, regardless of whether or not it should. Mudbound is set on a Mississippi Delta cotton farm in 1946. Henry McAllan (Jason Clarke) has decided to relocate his family there to fulfill a bucolic dream; however, the reality of their new lives fails to live up to his fantasies, particularly for his wife Laura (Carey Mulligan). Though Henry finds some happiness in living off the land, Laura suffers in their backwater home and begins to resent her situation, particularly the presence of her racist father-in-law (Jonathan Banks). The McAllans rent land to Hap (Rob Morgan) and Florence Jackson (Mary J. Blige), an African American couple. The Jacksons serve as a tidy counterpoint to the McAllans, and the itch to compare the two families only grows when both have a family member return home from the war. For the McAllans, it is Henry’s younger brother Jamie (Garrett Hedlund) while for the Jacksons, it is their son Ronsel (Jason Mitchell) who comes home. Each man reacts differently to coming out of war, but there is also the obvious fact that returning home is a different experience for them because Jamie is white and Ronsel is black. The mud of the title is ever-present and blatantly metaphorical, and this, combined with the overt comparisons between the McAllans and the Jacksons as well as the well-performed but overly expository voice-overs from six different characters, makes it feel as if Rees doesn’t completely trust her audience to decipher nuance. This is odd, because the performances and many of the technical credits – particularly Rachel Morrison’s beautifully, citrusy cinematography – are finely hewn and intentionally subtle. However, this is where the consideration of Rees herself comes in. As a queer, black, female director, she is the rarest of rare in Hollywood, and as such, what could be more subversive than creating a delicate, beautiful and intelligent period piece? 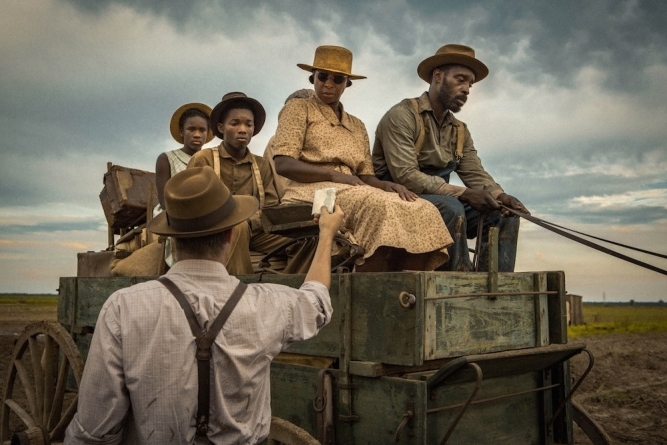 While her timely, excellent 2011 Pariah announced her as an almost anarchical talent, Mudbound makes a statement by showing straight, white, male mainstream filmmaking that she can do what they can do, but better. The approach makes sense, and also makes Mudbound feel a bit meta. While it’s a very good period drama, it is also aware of how good it is, and it is satisfying to see a filmmaker given the tools to really show her stuff. This is an important time for films about racial tension and that makes Mudbound current even if other parts of the film are old-fashioned. This tension plays particularly well across the faces of the always-good Carey Mulligan and a magnificent Mary J. Blige, who, like Rees, proves to be outstanding at playing against expectations. Though the warmth and the strength that comes across in her music is present, but she doesn’t rely upon them. Mudbound is an important film, both for its subject and because it further announces Dee Rees as a formidable talent. In her next film, it would be great to see her combine the strengths of Pariah and Mudbound, to demonstrate her excellent filmmaking skills while showing more of her current, unique voice. It feels as if she has the skills to tell any cinematic story, and hopefully she will be given the opportunities to tell many, many more.